Sadly, after a couple of weeks using Flock, I have to say I'm not too impressed. Sure it's nice to have a media bar at the top with your chosen Picasa or Flickr pics. And yes, it's cool to see Facebook updates in realtime on a sidebar. 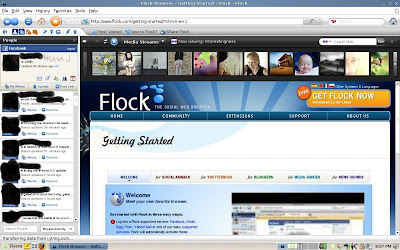 But when it comes to anything akin to real browsing, Flock fails. It's based on Firefox, but the experience only leaves you wanting for the real thing. In fact, I think it's overkill to design an entire browser to do some things that a few Firefox extensions could probably take care of. Too bad, as I thought it sounded like a cool idea. But over the course of two weeks, all I did was fire it up, watch the Facebook updates load, say, "Cool" and then load up Firefox to get my real browsing done.